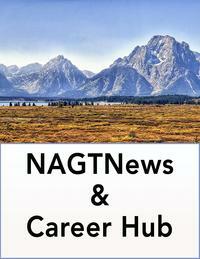 Along with print and web advertising, NAGT invites advertisements in the monthly NAGTNews email newsletter as well as job and internship postings in the NAGT Career Hub. The NAGTNews is distributed by email once a month to all NAGT members. 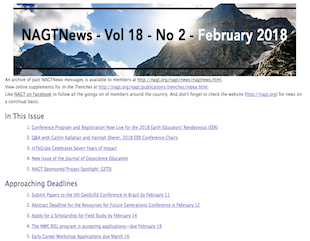 It is one of the primary avenues of member communication and features news, opportunities of interest to geoscience educators, announcements, events, highlights of member accomplishments, upcoming deadlines, job openings, and more. 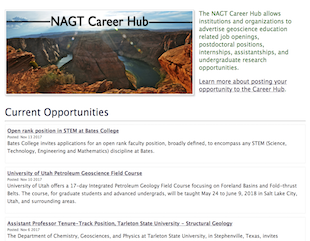 The NAGT Career Hub allows institutions and organizations to advertise geoscience education related opportunities that fall into one of five different categories: job openings, postdoctoral positions, internships, assistantships, and undergraduate research opportunities. To learn more about advertising on these platforms, view the downloadable NAGTNews & Career Hub Media Kit (Acrobat (PDF) 14.9MB Mar23 18).